I am writing to express my gratitude and appreciation for the support and guidance of TransParent before, during, and after my struggles with coming out to my family. In the months leading up to my decision to finally come out to my mother and move forward in my transition, Joan became a personal cheerleading section, demonstrating through consistent contact (through e-mail and in person) that she cared about my well-being. At first, I was under the impression that TransParent was a group specifically for the parents of people who are, plan on, or have transitioned, but I quickly discovered the resources available for people like myself — children who are preparing themselves for what could be one of the hardest decisions in life — the possibility of losing one's family, by choice. In all honesty, Joan and TransParent became like a second family to me, offering gentle guidance, encouragement, and advocacy in times that I felt scared to speak on my own behalf. Joan went above and beyond to ensure that I felt safe and supported, providing me with books, websites, numbers, and even volunteering to write a letter, from one parent to another, to augment my own letter to my mother. Without hesitation, I can easily say that coming out to my mother would not have gone as well as it did without the support of TransParent. I entered that conversation with the knowledge that I had Joan and TransParent as a solid foundation, and it gave me the confidence and courage to speak those ever-important initial words: Mom, I need to talk to you. I have touched on only a few of the resources that TransParent offers, but I can say that the biggest and most meaningful act of care caught me off guard at first — I will always remember the excited and enthused hug I received from Joan after telling her the news of my successful coming-out story. I will forever be indebted to the remarkable and literally life-saving support of TransParent, and hope that I will some day be able to return the favour, be it through the already-established services available through TransParent, or through something so simple as a hug. Thank you, TransParent. A sincere appreciation for reaching out and finding me. Your kindness and strength has inspired me to reach out with the hope of finding yet another “TransParent”. Gay men and lesbians in Canada enjoy rights unheard of even one generation ago. But prejudice is far from eradicated, and other sexual and gender minorities continue to be stigmatized and oppressed. At their annual meeting in May 2006, Canadian Unitarians and Universalists (www.cuc.ca) passed a resolution "that the Canadian Unitarian Council enlist the support of appropriate organizations and individuals to promote, where required, the inclusion of gender identity and gender expression as prohibited grounds of discrimination in federal, provincial and territorial human rights codes." We are happy to partner with TransParent in our efforts to build a society that affirms and promotes the equal rights of all persons, regardless of their sexual orientation, gender identity or gender expression. 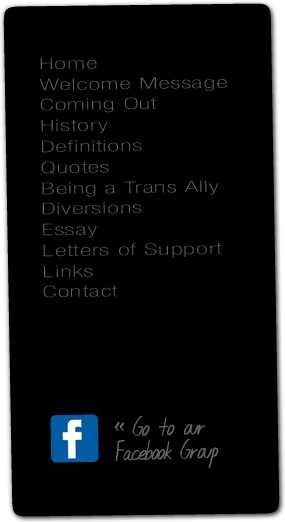 PFLAG Canada St. Catharines is pleased and proud to be connected with the organization TransParent. Our chapter has been providing support for parents and families of gay, lesbian and bisexual individuals in the Niagara Region for about 12 years. For the first half of this time we were barely aware of the needs of transgendered and transsexual individuals and their families. As our consciousness was raised we were eager to include them, but keenly aware of a lack of knowledge and resources to do so. When one of our members, Joan, undertook to form a support network specifically for parents and their trans children, we were happy to support that effort in any way we could. We know that in the short year since being established, TransParent has made a positive difference to a number of families. We hope we can work together for a long time to come.